[Image: Undersea robots guard the internet; image via Wired UK]. In what appears to be a sponsored post, a short article published on Wired UK presents an interesting scene in which semi-autonomous robots protect undersea internet cables from harm—that is, "dexterous robots toil at the bottom of the sea to safeguard the web." 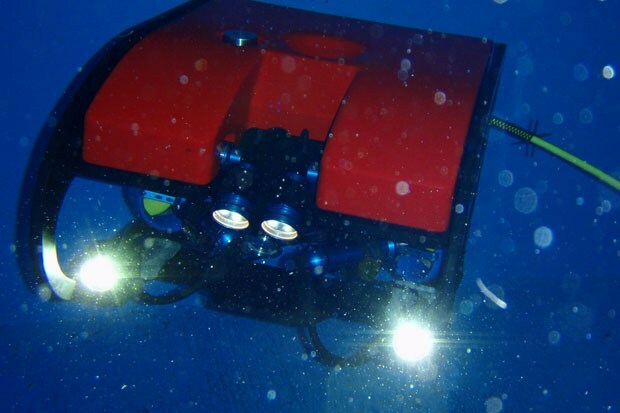 ROVs act like underwater robots, and are used to locate cable breaks on the seabed... and repair them. Once the ROV is lowered into the sea, a pilot on board one of our cable ships controls it to find the fault location and fix it. The idea that little machine-guardians at the bottom of the Atlantic Ocean, like mechanical demiurges on the invisible edge of the world, are at least partially responsible for ensuring that this post can be read in Europe is a comforting thought before bed. Check out the 1970's eco sci/fi flick Silent Running, where Bruce Dern first programs Huey, Duey, and Louie to perform surgery on him and then to tend the trees while Joan Baez caterwauls in the background. Disaster, copyright 1968 by Richard Brautigan. "submarine cables "the width of a human hair" support 95% of the world's internet traffic"
Ivan, I believe that reference is to the individual copper or fiber optic strands found within the otherwise rather massive cable, which you rightly point out is quite hefty. yes nonsense indeed. the fiberoptic filaments of the cable may be that thin, but the term cable refers to the collection of fibers in the aggregate.